We are able to transfer all standards 1 inch type C tape from the US (NTSC), UK (PAL) and (SECAM). The availability of 1 inch type C machines is surprisingly good, despite being phased out of production toward the end of the 1990s. The main problem with the transfer of 1 inch type C tape emerges from maintaining what are very complex machines -arguably one of the more complex electro-mechanical machines we have at Great Bear, compared with other professional broadcast formats like Betacam SP. To fully recalibrate a 1 inch type C machine would take a few days because of its size and complexity, while other machines would take a few hours! The recalibration of machines needs to take place when they wear out from over use, or get moved/knocked so that their mechanical parts are forced out of alignment. Both circumstances have obvious consequences for the quality of transfer, so machines need to be maintained at their highest operational level. Recalibration is complicated by machines having multiple components which all need to be aligned in a very careful way for the best quality transfer – it is not a simple case of adjusting the machine as a whole and everything works fine. Each separate transport mechanism requires attention. This is then checked against the other parts to ensure that the machine operates, and after that, the electronics. 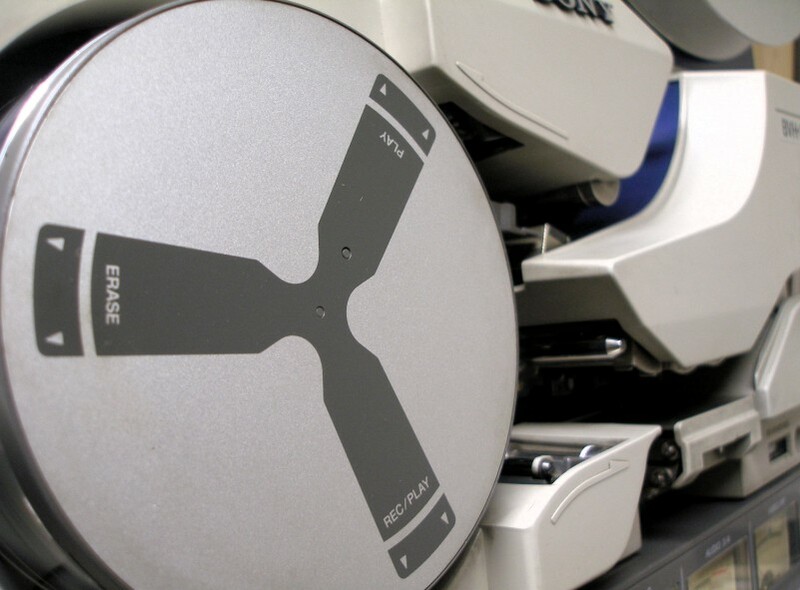 The recalibration process is complete when a machine plays back the tape in such a way that reflects the quality of the recording, rather inconsistencies in the machine. Of course another major threat to the future of such analogue transfers is that the highly skilled people who know how to maintain and fix these machines are slowly disappearing, along with spare parts to fix the machines. 1 inch Type C is a professional reel-to-reel analog recording helical scan videotape format co-developed and introduced by Ampex and Sony in 1976. It is capable of ‘trick-play’ functions such as still, shuttle, and variable-speed playback, including slow motion. Despite being a composite video format like U-matic or VHS, where video information is encoded on one channel (kind of like the analogue version of today’s digital compression), 1 inch Type C has very high video quality. It approaches the quality of component video formats, where the video signal has been split into two or more component channels, as used in Betacam videotapes and the Panasonic MII. The quality and reliability of 1 inch Type C made it a mainstay in television and video production in television studios for almost 20 years, before being supplanted by more compact videocassette formats like Betacam, DVCAM, D-1,D-2 and DVCPro.